This past weekend, my parents had a get together with their friends at our place, so I decided to try out a couple dessert recipes that I love! 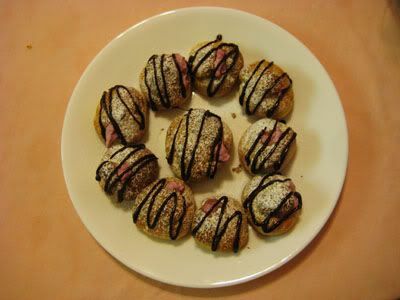 First up was cream puffs, but I did a variation on them, in which the cream was flavoured with fresh berries. 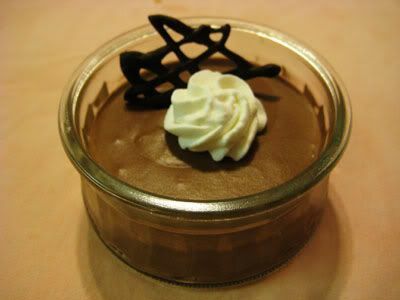 Second on the dessert menu was a decadent chocolate mousse. So delicious. I want to make them again now! 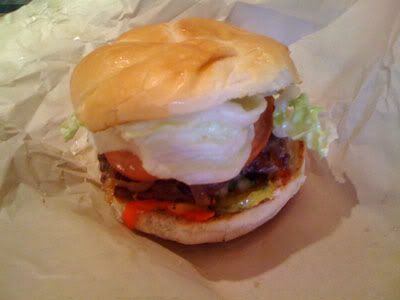 The burger was tasty, just as it was the first time I had been there. It took a little longer for them to make though, since they didn't have an assembly line going, haha. The day has finally come!! 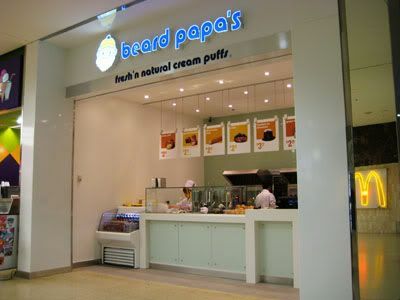 Beard Papa's has officially opened here at West Edmonton Mall. They are located near the body shop, straight across from McDonald's, and one location down from Edo Japan. 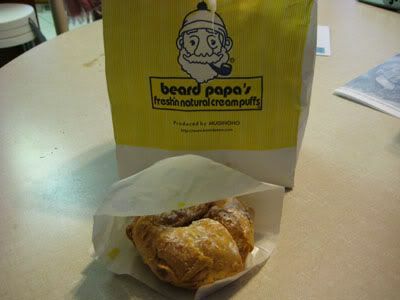 Everytime I go to Vancouver, I will hit up Aberdeen Mall in Richmond and pick up one of these delicious cream puffs. 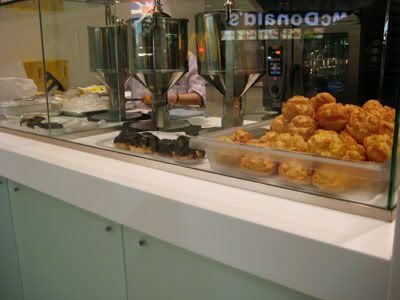 With the variety of fillings, its always fun to try out their different and unique flavours that you can't find in normal cream puffs. After class, Vince and I headed to the mall to check this place out. Upon our arrival, we found out that it was their second day open, and we had really high hopes for this place! They had all their flavours listed out on the board, so he chose green tea, while I chose mango. 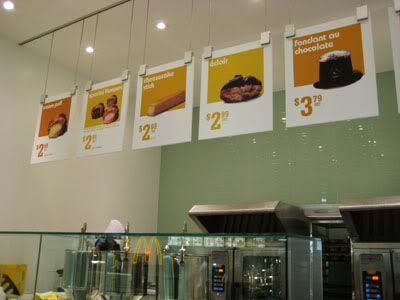 But upon ordering, we were told that they only have two flavours available each day. Vanilla, which is going to be offered year round, and the other will be the feature flavour of the day. On this particular day, it happened to be strawberry. So we purchased both, and were on our way home to enjoy them. Once I got home, I was thoroughly disappointed :( The filling on the inside was so runny, had a powdery/clumpy texture, and just made a big huge mess everywhere. This was completely different from the cream puffs that I had in Vancouver, but I'm hoping that the problems will be fixed and the experience I had was just a result of some issues happening during their first couple days open. I do highly recommend their cream puffs because they are delicious, but maybe give them some time before checking them out, so that they can fix up their minor errors! ETA - this past weekend, a coworker picked up some creampuffs for everyone on shift, and they were MUCH better! The filling was smooth and held together, so I think it's safe to check them out now! Back in the day when I was a kidlet, I remember mom & dad would bring my sister & I to Swiss Chalet cause we loved it so much! The kids meals were so good, and totally worth the prices too! It was a kid sized entree, bottomless drink, dessert and free toy, all for $5. That was many years ago though, so I have no idea what they are like now. I think what always made me want to go there on the weekends, was their delicious Chalet sauce, and the fact that their shirley temples were the most amazing things I had ever drank in my life. The shirley temples there aren't like the usual ones with orange juice in them, these I think are a mix of syrup and sprite, haha. But they're so good! I don't know why I love them so much! Anyway, this weekend we saught out our childhood memories, and cravings for the delicious sauce by heading to Swiss Chalet for my sister's birthday dinner. 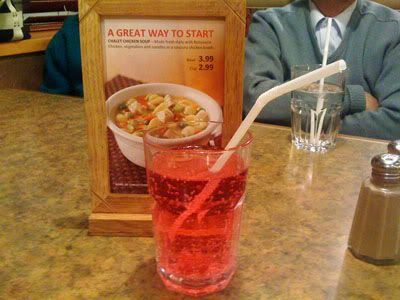 Since I wasn't able to order a kids meal, I opted for the shirley temple. Still just as good as always!! :) Vince thinks I'm gross for liking it though.. 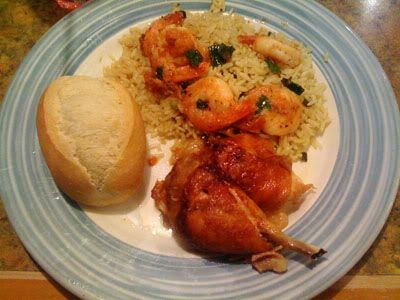 I ordered the quarter chicken with garlic shrimp & rice pilaf, served with a dinner roll. The chicken was tender, and very yummy with the Chalet sauce. Yes, I do understand that the sauce is made with lots of oil and fat, but hey, I come here maybe once every couple of years, so I think I should be allowed to indulge! What I didn't expect though, was how good the rice was! The herbs were mixed harmoniously and just tasted so good with the perfectly cooked rice. Little bits of tomato here and there were a nice touch as well, to switch up the texture. Swiss Chalet is a nice place to go to once in a while. The food was good, albeit not as amazing as I once though it was as a child. 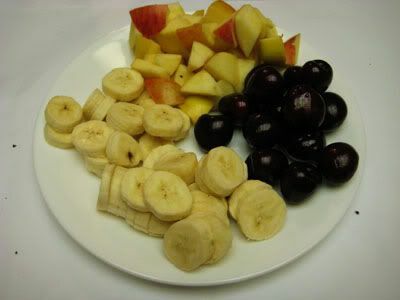 But that's understandable, tastes change, and kids aren't always the best food critics ;) The prices here are very reasonable, and a pretty good deal when it comes down to it. I was so excited that my Sephora Hello Kitty order arrived, that I forgot to post up the rest of the goodies that had come with my order, oops! I really don't like the fact that because I'm in Canada, I have to spend a minimum $120 to get free shipping, and pay extra for my products even though the dollar is pretty much on par. I guess their fast shipping & awesome return policy make up for it though! The smell is AMAZING, right on point! I absolutely love this kit! It's so nice that everything is separated, and won't be prone to mixing with one another. 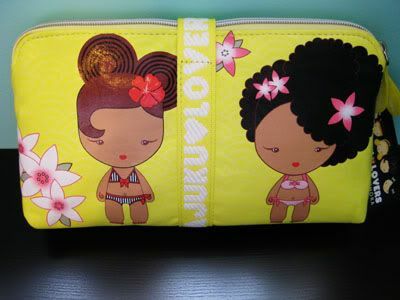 Also another great item for me to bring on trips, so that everything is kept together & I won't lose a single thing! Adorable. How could I say no to this?? After making my order with Sephora mid-December, and losing some hair trying to track down my package (Canada Post said it was delivered, when it hadn't been! 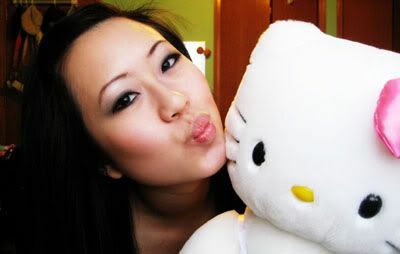 ), my Hello Kitty order has finally arrived!! 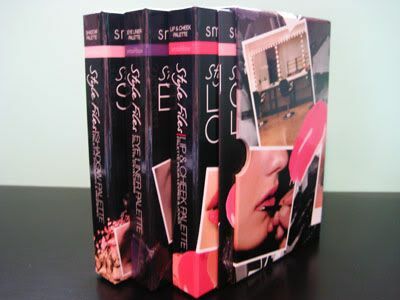 As stated before, I ordered the perfume rollerball, full size perfume, and the two eyeshadow/lip gloss palettes. 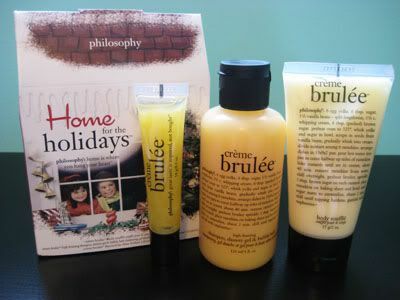 The fragrance full size fragrance and the rollerball contain the same scent. 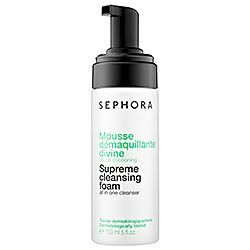 On Sephora, it was described as being made with some of Hello Kitty's favorite things, such as green apple and Japanese fruits to "make you smile inside". 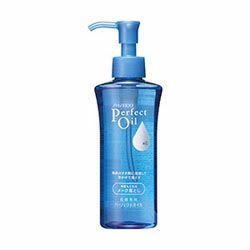 As listed, the perfume is supposed to contain notes of Cassis sorbet, Italian mandarin, apple, magnolia blossom, freesia, orange flower, tonka bean, vanilla, and musk. On first sniff of the fragrance, I could immediately sense the floral notes, but not so much the apple or citrus. Despite being floral, it was still sweet, and I actually really like this scent. After a bit of wear, you start to smell the sweetness of the vanilla, and the deeper musk scent. Although I don't need two of the same perfume, I can't resist the packaging! 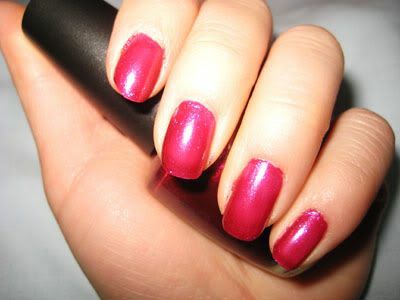 The rollerball will be nice to carry around in my bag as well, it's a great size! Now onto the palettes. 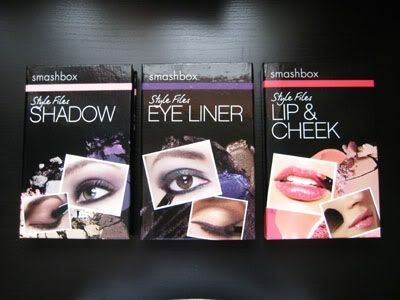 The eyeshadow and lipgloss palettes come in two varieties - happy fun and super fun. 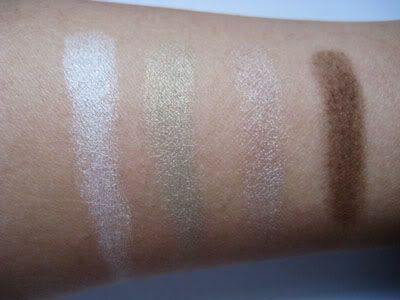 I don't know how they came up with the names, because I don't necessarily see those terms when I look at the colours! In terms of the lipglosses, I like the fact that it they are housed in a layer separate from the eyeshadow, so that there is no mess created. The lipglosses themselves have hardly any pigmentation, and putting them on the lips show very little differentiation between shades. They are a tad sticky, but nothing I can't deal with. 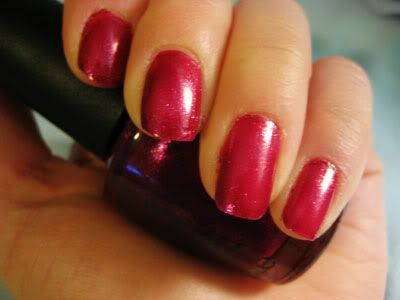 The formula is hydrating and sweet tasting, so they will be nice to wear on top of a lip stain or lipstick! 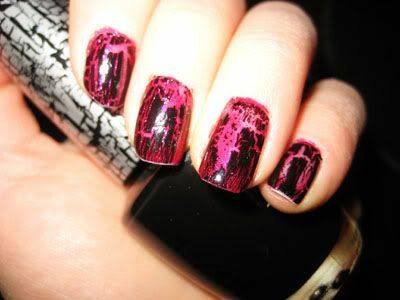 Don't expect to get any colour out of these though. 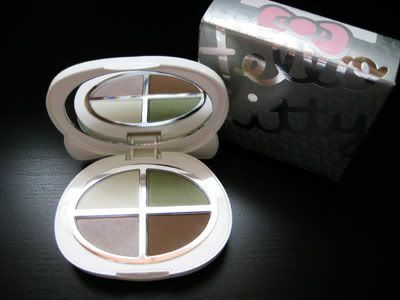 In this collection, part of the price you are paying definitely goes toward the novelty of having Hello Kitty makeup. 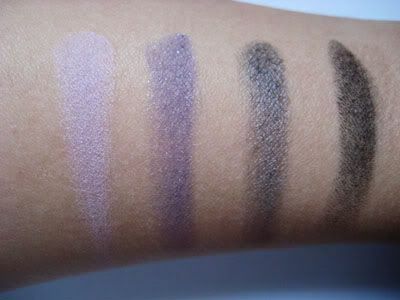 BUT, the packaging is sturdy, and I like the colours Sephora put into the collection in comparison to the black that MAC had used in their collaboration with Hello Kitty. 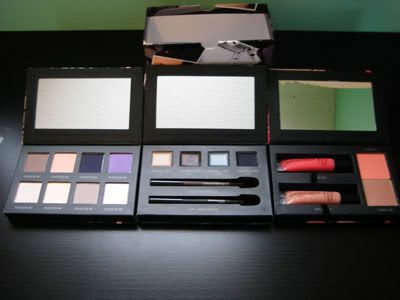 At first, the palettes gave me a bit of a hard time when I tried opening them (I have long nails), but overtime they have become much better. 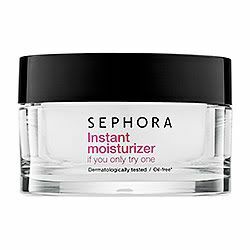 As I have said previously, this collection is limited edition, and not part of the permanent Sephora collection. 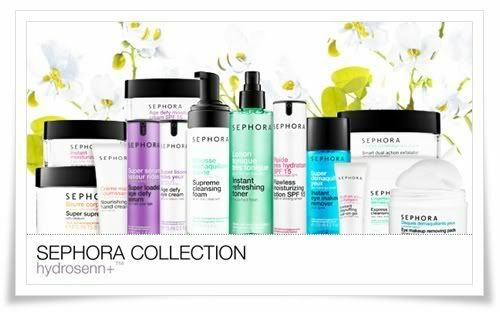 Make sure to test everything out before you buy, because this collection is proving to be relatively expensive for make up (the full size fragrance is marked at $77, palettes are $46). Going through my mother's old recipe book, I came across a recipe that I had made with my mom eons ago. I think we made the recipe when I was in grade three! That would be about.. 11 years ago. Needless to say, I was excited to make these for my family: chocolate cream cheese muffins! I can remember sitting in the kitchen with my mother, when she found the recipe in the community league newsletter, and to this day I'm so glad we cut it out and saved it! 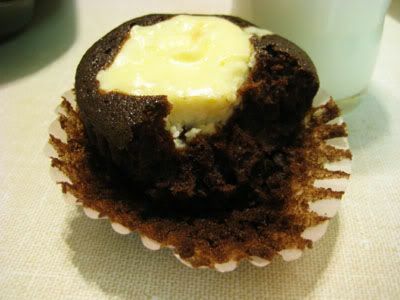 The chocolate cake in the muffin is very moist, yet light, to offset the dense cream cheese in the middle. 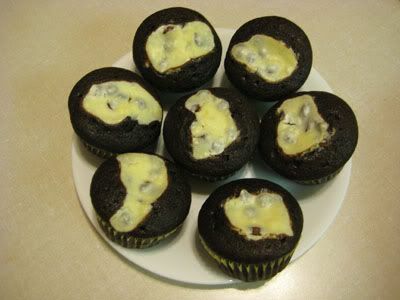 The cake also isn't very sweet, which is the perfect pairing to the chocolate chips hidden within the cream cheese mixture. They are perfect when you take them out of the oven! 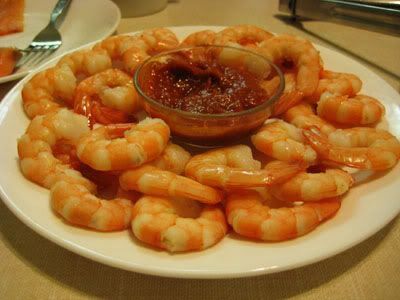 Warm, moist, and so satisfying when paired with a glass of milk! 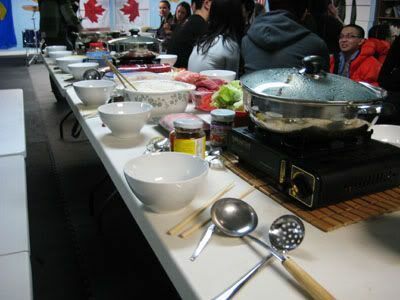 Yum, happy hot potting this winter! 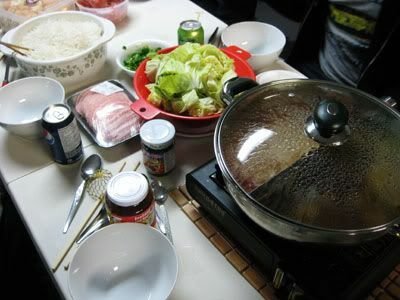 My night started with a nice sit down dinner with my family, cooked by my father. 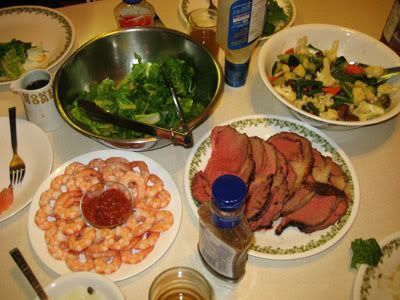 Nothing like perfectly cooked prime rib, salad, and a shrimp cocktail platter made by my mother! It was so cold out last night, there was no way I was going to see the fireworks downtown this year. 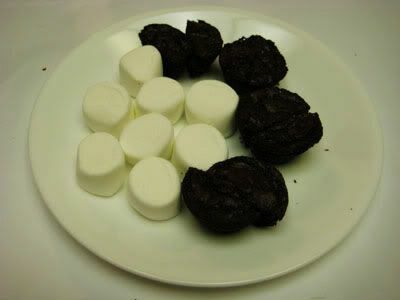 As an alternative, Vince & I stayed in to have chocolate fondue paired with a movie: Cloudy with a Chance of Meatballs. We had a great night, super chilled and relaxed. Hope you guys had a great night too! - be more studious, hit that 4.0 GPA! With the last day of Winter Camp finishing up at one of my jobs, my coworkers and I decided to head somewhere closeby for some New Years Eve pho. After passing by this place numerous times in the summer, I needed to check it out! There's just something about a little boy in a rice farmer hat that I can't pass up! 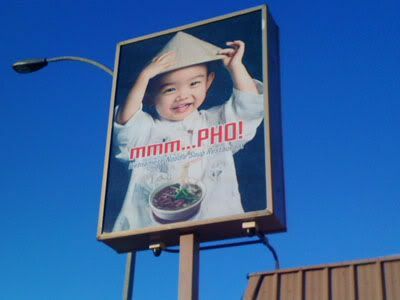 And there I was standing, outside of.. mmm...PHO! Such a little cutie on the sign! 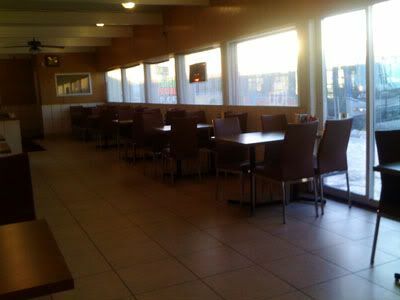 Walking into the restaurant, it was quite empty, but that's understandable considering it was only 3:30pm. However, I was surprised when the hostess chose to sit us down at the very back of the restaurant, far from the kitchen or any human interaction. It wasn't a big deal, because we were together in a big group, but I found it to be kind of odd.. 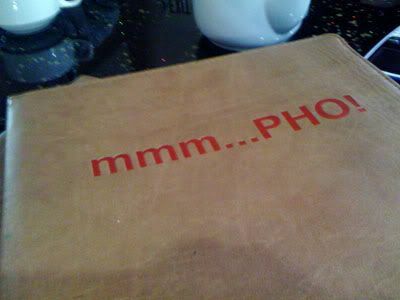 Opening up the menu, it was decent sized with a variety of options to choose from. One thing I liked was the fact that you were able to choose exactly what you wanted in your pho, and they didn't pre-determine options for you. 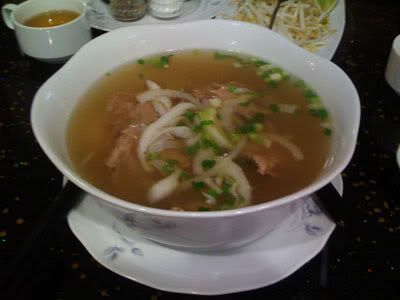 I ordered pho just the way I like it, with raw beef and tripe! I was excited to see how it would turn out. After what seemed to be forever (weird because we were the only customers..), our dishes arrived at the table, and I was a little disappointed just looking at it. It was obvious there wasn't a big portion of noodles inside the bowl, cause I couldn't even see anything in it but the meat floating on top! My observations were correct as I dug through the bowl, to find a little ball of noodles sitting at the bottom. Putting that aside, the broth was lacking depth. 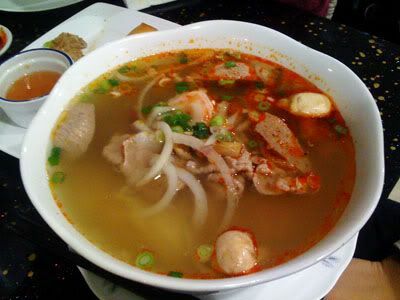 It was very watery, and comparing it to the tom yum noodle soup that Jobin ordered.. our soups tasted exactly the same. 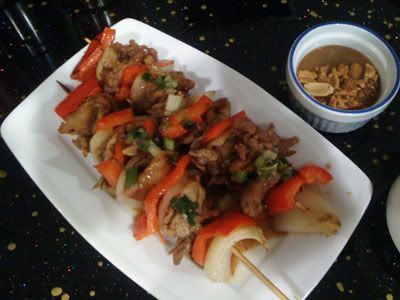 Her's had a trace of spiciness, but no lemongrass flavours or spiciness one would associate with tom yum soup. 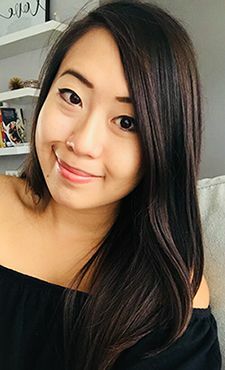 For the first time ever, I wasn't full after indulging in a bowl of pho. Vince was pretty much still starving, haha. Philippe ordered their skewers, which were quite flavourful. The meat wasn't too tough, and the peppers & onions still crisp. This is one option on the menu that isn't bad. I guess I really was lured into this restaurant by the little Asian boy. Maybe when he's a little more grown up, I'll stop by and give this restaurant another shot. Looking at Urbanspoon, they have a pretty high rating of 85%, so hopefully this was just an off day for them.